"Skateboarder" redirects here. For the magazine, see Skateboarder magazine. Since the 1970s, skateparks have been constructed specifically for use by skateboarders, Freestyle BMXers, aggressive skaters, and very recently, scooters. The first skateboards started with wooden boxes, or boards, with roller skate wheels attached to the bottom. Crate scooters preceded skateboards, having a wooden crate attached to the nose (front of the board), which formed rudimentary handlebars. The boxes turned into planks, similar to the skateboard decks of today. An American WAC, Betty Magnuson, reported seeing French children in the Montmartre section of Paris riding on boards with roller skate wheels attached to them in late 1944. The magazine only lasted four issues, but resumed publication as Skateboarder in 1975. The first broadcast of an actual skateboarding competition was the 1965 National Skateboarding Championships, which were held in Anaheim, California and aired on ABC’s “Wide World of Sports. Because skateboarding was a new sport during this time, there were only two original disciplines during competitions; flatland freestyle & slalom downhill racing. One of the earliest sponsored skateboarders, Patti McGee, was paid by Hobie and Vita Pak to travel around the country to do skateboarding exhibitions and to demonstrate skateboarding safety tips. McGee made the cover of Life magazine in 1965 and was featured on several popular television programs The Mike Douglas Show, What's My Line? and The Tonight Show Starring Johnny Carson, which helped make skateboarding even more popular at the time. Some of the other well known surfer-style skateboarders of the time also included Danny Bearer, Torger Johnson, Bruce Logan, Bill and Mark Richards, Woody Woodward, & Jim Fitzpatrick. In the early 1970s skateparks hadn't been invented yet, so skateboarders would flock and skateboard in such urban places like The Escondido reservoir in San Diego, California. Skateboarding magazine would publish the location and Skateboarders made up nicknames for each location such as the Tea Bowl, the Fruit Bowl, Bellagio, the Rabbit Hole, Bird Bath, the Egg Bowl, Upland Pool and the Sewer Slide. Some of the development concepts in the terrain of skateparks were actually taken from the Escondido reservoir. Many companies started to manufacture trucks (axles) specially designed for skateboarding, reached in 1976 by Tracker Trucks. As the equipment became more maneuverable, the decks started to get wider, reaching widths of 10 inches (250 mm) and over, thus giving the skateboarder even more control. A banana board is a skinny, flexible skateboard made of polypropylene with ribs on the underside for structural support. These were very popular during the mid-1970s and were available in a myriad of colors, bright yellow probably being the most memorable, hence the name. In 1975 skateboarding had risen back in popularity enough to have one of the largest skateboarding competition's since the 1960s, the Del Mar National Championships, which is said to have had up to 500 competitors. The competition lasted two days and was sponsored by Bahne Skateboards & Cadillac Wheels. While the main event was won by freestyle spinning skate legend Russ Howell, a local skate team from Santa Monica, California, the Zephyr team, ushered in a new era of surfer style skateboarding during the competition that would have a lasting impact on skateboarding's history. With a team of 12, including skating legends such as Jay Adams, Tony Alva, Peggy Oki & Stacy Peralta, they brought a new progressive style of skateboarding to the event, based on the style of Hawaiian surfers Larry Bertlemann, Buttons Kaluhiokalani and Mark Liddell. Craig Stecyk, a photo journalist for Skateboarder Magazine wrote about and photographed the team, along with Glen E. Friedman, shortly afterwards and ran a series on the team called the Dogtown articles, which eventually immortalized the Zephyr skateboard team. The team became known as the Z-Boys and would go on to become one of the most influential teams in skateboarding's history. It was soon after that skateboarding contest for cash and prizes using a professional tier system began to be held throughout California, like the The California Free Former World Professional Skateboard Championships, which featured Freestyle and Slalom competitions. In March 1976, Skateboard City skatepark in Port Orange, Florida and Carlsbad Skatepark in San Diego County, California, would be the first two skateparks to be opened to the public in just a week apart. They were the first of some 200 skateparks that would be built through 1982. This was due in part to articles that were running in the Investment Journals at the time, stating that skateparks were a good investment. Notable skateboarders from the 1970s also include Ty Page, Tom Inouye, Laura Thornhill, Ellen O'Neal, Kim Cespedes, Bob Biniak, Jana Payne, Waldo Autry, Robin Logan, Bobby Piercy, Russ Howell, Ellen Berryman, Shogo Kubo, Desiree Von Essen, Henry Hester, Robin Alaway, Paul Hackett, Michelle Matta, Bruce Logan, Steve Cathey, Edie Robertson, Mike Weed, David Hackett, Gregg Ayres, Darren Ho, and Tom Sims. As a result of the "vert" skating movement, skate parks had to contend with high-liability costs that led to many park closures. In response, vert skaters started making their own ramps, while freestyle skaters continued to evolve their flatland style. Thus by the beginning of the 1980s, skateboarding had once again declined in popularity. Freestyle skating remained healthy throughout this period, with pioneers such as Rodney Mullen inventing many of the basic tricks that would become the foundation of modern street skating, such as the "Impossible" and the "kickflip". The influence that freestyle exerted upon street skating became apparent during the mid-1980s; however, street skating was still performed on wide vert boards with short noses, slide rails, and large soft wheels. In response to the tensions created by this confluence of skateboarding "genres", a rapid evolution occurred in the late 1980s to accommodate the street skater. Since few skateparks were available to skaters at this time, street skating pushed skaters to seek out shopping centers and public and private property as their "spot" to skate (public opposition, in which businesses, governments, and property owners have banned skateboarding on properties under their jurisdiction or ownership, would progressively intensify over the following decades). 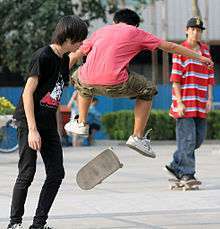 By 1992, only a small fraction of skateboarders remained as a highly technical version of street skating, combined with the decline of vert skating, produced a sport that lacked the mainstream appeal to attract new skaters. By 2001 skateboarding had gained in such popularity, that more participants under the age of 18 rode skateboards (10.6 million) than played baseball (8.2 million), although traditional organized team sports still dominated youth programs overall. Skateboarding and skateparks began to be viewed and used in a variety of new ways to compliment academic lessons in schools, including new non-traditional physical education skateboarding programs, like Skatepass and Skateistan that are used to encourage youth to have better attendance, self-discipline and confidence. This was also based on the healthy physical opportunities skateboarding was understood to bring participants for muscle & bone strengthening, balance and the positive impacts it can have on youth in teaching them mutual respect, social networking, artistic expression and an appreciation of the environment. In 2003 Go Skateboarding Day was founded in southern California by the International Association of Skateboard Companies to promote skateboarding throughout the world. It is celebrated annually on June 21 “to define skateboarding as the rebellious, creative celebration of independence it continues to be.” According to market research firm American Sports Data the number of skateboarders worldwide increased by more than 60 percent between 1999 and 2002—from 7.8 million to 12.5 million. Many cities also began implementing recreation plans and statutes, during this time period, as part of their vision for local parks and communities to make public lands more available in particular, for skateboarding, inviting skateboarders to come in off of the city streets and into organized skateboarding activity areas. By 2006 there were over 2,400 Skateparks worldwide and the design of skateparks themselves had made a transition, as skaters turned designers, began to emerge in the field adding features for all levels of skaters. Many new places to skateboard designed specifically for street skaters, such as the “Safe Spot Skate Spot” program, first initiated by professional skateboarder Rob Dyrdek throughout many cites, allowed for the creation of smaller alternative safe skate plazas to be built at a lower cost. One of the largest locations ever built to skateboard in the world, SMP Skatepark in China, at 12,000 square meters in size, was built complete with a 5,000-seat stadium. The image of the skateboarder as a rebellious, non-conforming youth has faded in recent years. Certain cities still oppose the building of skateparks in their neighborhoods, for fear of increased crime and drugs in the area. The rift between the old image of skateboarding and a newer one is quite visible: magazines such as Thrasher portray skateboarding as dirty, rebellious, and still firmly tied to punk, while other publications, Transworld Skateboarding as an example, paint a more diverse and controlled picture of skateboarding. Furthermore, as more professional skaters use hip hop, reggae, or hard rock music accompaniment in their videos, many urban youths, hip-hop fans, reggae fans, and hard rock fans are also drawn to skateboarding, further diluting the sport's punk image. Films such as the 1986 Thrashin', Grind and Lords of Dogtown, have helped improve the reputation of skateboarding youth, depicting individuals of this subculture as having a positive outlook on life, prone to poking harmless fun at each other, and engaging in healthy sportsman's competition. According to the film, lack of respect, egotism and hostility towards fellow skateboarders is generally frowned upon, albeit each of the characters (and as such, proxies of the "stereotypical" skateboarder) have a firm disrespect for authority and for rules in general. Group spirit is supposed to heavily influence the members of this community. In presentations of this sort, showcasing of criminal tendencies is absent, and no attempt is made to tie extreme sports to any kind of illegal activity. Gleaming the Cube, a 1989 movie starring Christian Slater as a skateboarding teen investigating the death of his adopted Vietnamese brother, was somewhat of an iconic landmark to the skateboarding genre of the era. Many well-known skaters had cameos in the film, including Tony Hawk and Rodney Mullen, where Mullen served as Slater's stunt double. Whilst early skateboarders generally rode barefoot, preferring direct foot-to-board contact, and some skaters continue to do so, one of the early leading trends associated with the sub-culture of skateboarding itself, was the sticky sole "Slip-On" Skate shoe, most popularized by Sean Penn's skateboarding character from the film Fast Times at Ridgemont High. Because early skateboarders were actually surfers trying to emulate the sport of surfing, at the time when skateboards first came out on the market, many skateboarded barefoot. But skaters often lacked traction, which led to foot injuries. This necessitated the need for a shoe that was specifically designed and marketed for skateboarding, such as the Randy "720", manufactured by the Randolph Rubber Company, and Vans sneakers, which eventually became cultural iconic signifiers for skateboarders during the 70s & 80's as skateboarding became more widespread. While the skate shoes design afforded better connection & traction with the deck, skaterboarders themselves could often be identified when wearing the shoes, with Tony Hawk once saying, "If you were wearing Vans shoes in 86, you were a skateboarder" Because of its connection with skateboarding, Vans financed the legendary skateboarding documentary Dogtown and Z-Boys and was the first sneaker company to endorse a professional skateboarder Stacy Peralta. Vans has a long history of being a major sponsor of many of skateboarding's competitions and events throughout skateboarding's history as well, including the Vans Warped Tour and the Vans Triple Crown Series. There were several artistic skateboarding pioneer's that had an influence on the culture of skateboarding during the 1980s, that transformed skateboard-deck art like Jim Phillips, who's edgy comic-book style "Screaming Hand", not only became the main logo for Santa Cruz Skateboards, but eventually transcended into tattoos of the same image for thousands of people & vinyl collectable figurines over the years. Artist Vernon Courtlandt Johnson is said to have used his artwork of skeletons and skulls, for Powell Peralta, during the same time that the music genres of punk rock and new wave music were beginning to mesh with the culture of skateboarding. Some other notable skateboard artists that made contribrutions to the culture of skateboarding also include Andy Jenkins, Todd Bratrud, Neil Blender, Marc McKee, Tod Swank, Mark Gonzales, Lance Mountain, Natas Kaupas and Jim Evans. Over the years skateboard-deck art has continued to influence and expand the culture of skateboarding, as many people began collecting skateboards based on their artistic value and nostalgia. Productions of limited editions with particular designs and types of collectible prints that can be hung on the wall, have been created by such famous artist as Andy Warhol and Keith Haring. Most professional skateboarders today have their own signature skateboard decks, with their favorite artistic designs printed on them using Computer graphics. The use, ownership and sale of skateboards were forbidden in Norway from 1978 to 1989 because of the high number of injuries caused by boards. The ban led skateboarders to construct ramps in the forest and other secluded areas to avoid the police. There was, however, one legal skatepark in the country in Frognerparken in Oslo. For styles of skateboarding, see Skateboarding styles. Trampboarding is a variant of skateboarding that uses a board without the trucks and the wheels on a trampoline. Using the bounce of the trampoline gives height to perform a tricks, whereas in skateboarding you need to make the height by performing an ollie. Trampboarding is seen on YouTube in numerous videos. Swing boarding is the activity where a skateboard deck is suspended from a pivot point above the rider which allows the rider to swing about that pivot point. The board swings in an arc which is a similar movement to riding a half pipe. The incorporation of a harness and frame allows the rider to perform turns spins all while flying though the air. Skateboarding is sometimes associated with property damage to urban terrain features such as curbs, benches, and ledges when skateboarders perform tricks known as grinds on these surfaces. Private industry has responded to this perceived damage with skate deterrent devices, such as the Skatestopper, in an effort to mitigate damage and discourage skateboarding on these surfaces. The passing of ordinances and the use of posted signs stating "Skateboarding is not allowed" have also become common methods to mitigate skateboarding in public areas in many cities, to protect pedestrians and property. In the area of street skating, tickets and arrest from police for trespassing are not uncommon. ↑ Ocean Howell (2003). "Extreme Market Research". Topic Magazine. Topic Magazine. Retrieved August 17, 2012. ↑ Montgomery, Tiffany (May 12, 2009). "The state of the skateboarding industry". Retrieved July 23, 2014. ↑ "Skateboarding Is Officially an Olympic Sport. What Now?". August 6, 2016. Retrieved August 8, 2016. ↑ Steve Cave, about.com. "Skateboarding: A Brief History (page 2)". Retrieved December 13, 2006. 1 2 3 4 Marcus, Ben; Grggi, Lucia (2011). The Skateboard: The Good, the Rad, and the Gnarly: An Illustrated History. MVP Book. Retrieved October 26, 2012. 1 2 3 "Skateboarding: A Brief History (page 1)". Retrieved September 1, 2007. 1 2 3 4 5 Brooke, Michael (1999). "The Concrete Wave: The History of Skateboarding". Warwick Publishing Inc. Retrieved October 26, 2012. 1 2 3 Borden, Iain (2001). Skateboarding, Space and the City: Architecture and the Body. Oxford. Retrieved November 8, 2012. ↑ Weyland, Jocko (2002). The Answer Is Never: A Skateboarder's History of the World. Grove Press. Retrieved November 10, 2012. ↑ Rompella, Natalie (2007). Famous Firsts: The Trendsetters, Groundbreakers & Risk-Takers Who Got America Moving!. Lobster Press. ↑ gbemi (August 29, 2012). "Brian Logan Interview". Thane Magazine. Retrieved October 27, 2012. ↑ Cave, Steve. "A Brief History of Skateboarding". About.com. Retrieved November 10, 2012. ↑ Smith, Jack (2009). The Skateboarder's Journal - Lives on Board. The Morro Skateboard Group. Retrieved October 26, 2012. 1 2 Lannes, Xavier (2011). "Five writers that changed the way we read skateboarding magazines". Retrieved November 12, 2012. ↑ VintageSkateboardMagazine (2007). "The Quarterly Skateboarder (USA)". osephdreams. Retrieved October 27, 2012. ↑ VintageSkateboardMagazine (2007). "Skateboarder (USA)". osephdreams. Retrieved October 27, 2012. ↑ Surfstyley4 (April 7, 2010). "GIRLS Skateboarding 1965 Skateboard Championships". Starrfilms. YouTube. Retrieved October 27, 2012. ↑ slalomvideos (June 17, 2010). "1965 American Skateboard Slalom Championships - Anaheim, California". YouTube. ↑ Bill Eppridge. "LIFE Goes Skateboarding, 1965". Time magazine. Retrieved December 12, 2012. ↑ Surfstyley (January 25, 2011). "Patti McGee Skateboard Champion Tv 1965". Starrfilms. YouTube. Retrieved October 27, 2012. ↑ Surfstyley (October 31, 2010). "Patti McGee 1965 Skateboard Champion on What's My Line". Starrfilms. YouTube. Retrieved October 27, 2012. ↑ "Patti McGee interview with isTia". I Skate Therefore I Am. October 17, 2011. Retrieved October 27, 2012. 1 2 "Skateboarding History". Retrieved September 2, 2007. 1 2 "Jim Fitzpatrick Interview". I Skate Therefore I Am. January 6, 2011. Retrieved November 10, 2012. 1 2 3 4 Mortimer, Sean (2008). Stalefish: Skateboard Culture from the Rejects Who Made It. Chronicle Books. ISBN 9780811860420. Retrieved November 3, 2012. ↑ "Stacy Peralta 1st SkateBoarder Magazine Interview". Z-Boys.com. SkateBoarder Magazine. October 1976. Retrieved November 3, 2012. ↑ Ben Marcus (May 24, 2012). "Sims Contributions and Importance to Skateboarding". Calstreets. Retrieved November 5, 2012. ↑ Dan Gesmer. "Russ Howell Interview". Skate Legends.com. Retrieved November 3, 2012. ↑ Steve Cave. "The True Story of Dogtown and the Zephyr Team". About.com. Retrieved November 3, 2012. ↑ Dogtown Skateboards. "Our only Crime is Being Original". Retrieved November 24, 2012. ↑ Craig Stecyk; Glen E. Friedman; C. R. Stecyk (2002). Dogtown: The Legend Of The Z-Boys. Burning Flags Press. Retrieved November 3, 2012. ↑ Brisick, Jamie (2004). Have Board, Will Travel: The Definitive History of Surf, Skate, and Snow. ISBN 0060563591. 1 2 Lannes, Xavier. "Happy Birthday Ellen Oneal". istia. Retrieved November 17, 2012. ↑ Mike Horelick (November 18, 2007). "Board out of their minds". Los Angeles Times. Retrieved November 17, 2012. ↑ Killeen Gonzalez (June 9, 2011). "vHistory of skateboard competitions 1960s to 1980s: A brief overview". Yahoo. Retrieved November 17, 2012. ↑ Doeden, Matt (2002). Skateparks: Grab Your Skateboard. Capstone Press. ISBN 0-7368-1072-2. ↑ Transworld (October 11, 2005). "GASBAG". Transworld Skateboarding. Bonnier Corporation. Retrieved August 17, 2012. ↑ Thomas Slee. "Skate For Life: An Analysis of the Skateboarding Subculture" (PDF). Skate For Life: An Analysis of the Skateboarding Subculture (Honors Thesis). USF University of South Florida. Retrieved August 17, 2012. ↑ Ocean Howell (2001). "The Poetics of Security: Skateboarding, Urban Design, and the New Public Space|1". Urban Action 2001. San Francisco State University. Retrieved August 17, 2012. ↑ "HOME FREESTYLE Freestyle". Skateboard Express. Retrieved March 20, 2013. 1 2 John Weyler (February 2003). "Why kids climb higher and jump farther - on their own terms". OC Metro. Retrieved December 2, 2012. ↑ "Skateboards coming to a gym class near you". NBC News. May 9, 2006. Retrieved December 12, 2012. ↑ Simon Crerar (August 23, 2012). "Female skateboarder pulls off fearless big air at Bamiyan Buddha site". News Limited Network. Retrieved December 12, 2012. ↑ Ellen Greenlaw (2012). "What Do You Know About PE for Kids?". WebMD. Retrieved December 1, 2012. ↑ "Ramp it Up: Skateboard Culture in Native America". Smithsonian National Museum of the American Indian. 2009. Retrieved December 1, 2012. ↑ Sara-Ellen Amster (December 2000). "Getting a Jump on Good Health". Volume 16, Number 6. Harvard University. Retrieved December 1, 2012. ↑ Kelli Hargrove (May 24, 2012). "'Just one Board' Skateboard Recycling Program". Transworld Business. Retrieved December 1, 2012. ↑ Jacy Danque (June 20, 2012). "'Just One Board' offers skateboarders a chance to give back to their community". OC Metro. Retrieved December 1, 2012. ↑ "Why a Skatepark is a Good Idea". Wheelscape. Retrieved December 1, 2012. ↑ "2008 Physical Activity Guidelins for Americans". Centers for Disease Control and Prevention. 2008. Retrieved December 1, 2012. ↑ Vickie Kavanagh (June 15, 2011). "Celebrate International Go Skateboarding Day Tuesday in Wilsonville". The Oregonian. Retrieved December 16, 2012. ↑ "GO SKATEBOARDING DAY 2012 PICS". The Adrenalist. Unilever. June 22, 2012. Retrieved May 25, 2013. ↑ Ricardo Lopez; Andrew Blankstein (June 22, 2011). "Hundreds in L.A. celebrate Go Skateboarding Day". Los Angeles Times. Retrieved November 18, 2012. ↑ Steve Cave. "Go Skateboarding Day". About.com. Retrieved November 18, 2012. ↑ "United States Government Goes Skateboarding". GlobeNewswire, Inc. June 11, 2007. Retrieved December 8, 2012. ↑ Kelli Hargrove (June 13, 2012). "Just One Board Makes Its Mark On Go Skateboarding Day". Transworld Business. Retrieved December 12, 2012. ↑ Domingo Antonio Robledo (June 8, 2011). "Globe International Headquarters". Australian Design Review. Niche Media. Retrieved May 25, 2013. ↑ Richard Lacayo (July 30, 2006). "It's All in the Swoop". Time Magazine. Retrieved December 3, 2012. ↑ The Florida Legislature (1999) (c. 1999). "The 1999 Florida Statutes 316.0085 Skateboarding; inline skating; freestyle bicycling; definitions; liability.". leg.state.fl.us. Archived from the original on April 5, 2014. Retrieved December 1, 2012. ↑ Childs, Marti; March, Jeff (Spring 2002). "Issues Facing California's Skate Parks". California Park & Recreation Society. p. 32. Retrieved December 1, 2012. ↑ Ben Wixon (2009). Skateboarding Instruction, Programming and Park Design. Human Kinetics. Retrieved December 2, 2012. ↑ Blair Alley (May 15, 2012). "Kansas City's First Safe Spot Skate Spot". Transworld Skateboarding. Retrieved December 3, 2012. ↑ Jonathan Chow (June 20, 2008). "Skateboarding with Chinese Characteristics". University of Southern California. Retrieved November 2, 2012. ↑ "Six added to Skateboarding Hall of Fame". ESPN Action. November 2, 2010. Retrieved October 27, 2012. ↑ Thomas Gase (May 5, 2008). "Hawk, other skateboarding legends slated to attend book signing at Skatelab". Simi Valley Acorn. Retrieved December 22, 2012. ↑ "12 year old lands the first ever 1080 on a skateboard". Skateboarding.com.au. July 3, 2012. Retrieved October 7, 2012. ↑ "12-year-old skateboarder nails first ever 1080" (video). Red Bull. March 30, 2012. Retrieved April 3, 2012. ↑ Winters, David (2003) . Thrashin' (Commentary track). MGM Home Video. ASIN B00009OWJZ. ↑ "Team Ice Cream Skate Video". Retrieved January 7, 2007. ↑ "Roots, Rock, Reggae, Skateboarding". Retrieved July 23, 2003. ↑ Cantin-Brault, Antoine. "The Reification of Skateboarding" (PDF). iscsjournal.com. International Journal of Science Culture and Sport. Retrieved 5 October 2015. ↑ Buckingham, David. 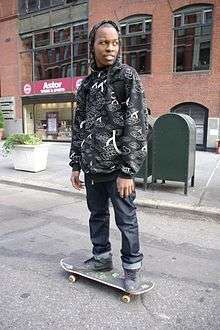 "Skate Perception: Self-Representation, identity and visual style in a youth subculture". ↑ Hang Nguyen (June 1, 2007). "Vans strides back to O.C.". Orange County Register. Retrieved October 29, 2012. ↑ David Browne (2012). "Jimmy Van Doren: Skating's Accidental Hero". Men's Journal. Retrieved November 13, 2012. ↑ Josh Rabinowitz (November 23, 2002). "Microsoft, Video Games, and Vans Skateparks". SkateboardDirectory. Retrieved October 28, 2012. ↑ Vans Inc. (December 26, 2003). "Vans Second Quarter Sales and Earnings". SkateboardDirectory. Retrieved October 28, 2012. ↑ "Xbox sponsors vans triple crown". Transworld Snowboarding. July 23, 2001. Retrieved October 28, 2012. ↑ Vans (2000). "World's Best Skateboarders to Compete in Southern California". PRNewswire. Retrieved October 29, 2012. 1 2 Jurgen Blumlein; Daniel Schmid; Dirk Vogel (July 1, 2010). Made for Skate:The Illustrated History of Skateboard Footwear. Gingko Press. Retrieved November 2, 2012. ↑ Davis, James (2004). Skateboarding is not a Crime: 50 years of Street Culture. Firefly Books. p. 67. ISBN 9781554070015. ↑ Ari Marsh (December 1, 2005). "Dog Town Chronicles:Wes Humpston". Juice Magazine. Retrieved November 17, 2012. ↑ Walrus TV (December 2, 2009). "Walrus TV: Wes Humpston Interview from "The Run Up"". Retrieved November 17, 2012. ↑ V.Courtlandt Johnson (September 25, 2009). "Skateboarding's History in Graphics". the Wall Street Journal. Retrieved November 17, 2012. ↑ Kendra Gaines (June 14, 2012). "Art on Board: Skateboarding and the Artistic Sub-Culture". Noupe. Retrieved December 8, 2012. ↑ Mary Spicuzza (May 1998). "Extreme Success". Metro Santa Cruz. Retrieved November 18, 2012. ↑ "Jim Phillips Q/A". Skateboarder Magazine. June 1, 2006. Retrieved November 18, 2012. ↑ Wallace Baine (April 12, 2012). "The wild, aggressive artwork of Jimbo Phillips carries on a well-known Santa Cruz dynasty". Santa Cruz Sentinel. Retrieved November 18, 2012. ↑ Jeff DiNunzio (March 24, 2011). "VCJ rejoins Powell-Peralta". ESPN Action Sports. Retrieved November 24, 2012. ↑ Brian Wingate (2003). The World of Skateboarding. Rosen Publishing group. Retrieved November 28, 2012. ↑ Xavier Lannes (March 14, 2011). "The skateboard in the hat". I Skate Therefore I Am. Retrieved December 8, 2012. ↑ Josh Brooks (November 4, 2009). "Indisposable: "The Disposable Skateboard Bible"". ESPN Action Sports. Retrieved December 8, 2012. ↑ Andy Horsley (2012). 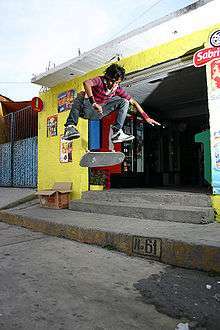 To the Limit Skateboarding. Rosen Publishing group. Retrieved November 28, 2012. ↑ Fleming, Robin (August 14, 2012). "Keith Haring x Alien Workshop". ESPN Action Sports. Retrieved November 28, 2012. 1 2 3 4 5 Fountain, JL. ; Meyers, MC. (Dec 1996). "Skateboarding injuries.". Sports Med. 22 (6): 360–6. doi:10.2165/00007256-199622060-00004. PMID 8969014. 1 2 Keilani, M.; Krall, C.; Lipowec, L.; Posch, M.; Komanadj, TS. ; Crevenna, R. (Jul 2010). "Skateboarding injuries in Vienna: location, frequency, and severity.". PM&R. 2 (7): 619–24. doi:10.1016/j.pmrj.2010.04.022. PMID 20659717. ↑ White, Kimberly (July 11, 2011). "Woman killed after collision with skateboarder had been hit by one 15 years prior". San Jose Mercury News. ↑ "The secret skateboarders who defied Norway's 11-year ban". BBC. Retrieved 19 April 2016. ↑ Forsman, L.; Eriksson, A. (June 26, 2001). "Skateboarding injuries of today". British Journal of Sports Medicine. BMJ Publishing Group. 35: 325–328. doi:10.1136/bjsm.35.5.325. ↑ "Norway to Ban Skateboards". Sarasota Herald-Tribune. September 14, 1978. Retrieved October 13, 2012. ↑ "Board shapes and its uses » Blog Archive » Longboard Girls Crew". longboardgirlscrew.com. Retrieved 2016-09-26. ↑ Behre, Robert (March 23, 2012). "Skateboarders face legal roadblocks". The Post and Courier. Retrieved October 13, 2012. ↑ LCPL CHRISTOPHER L. VALLEE (March 16, 1999). "URBAN WARRIOR `99". DefenseImagery.mil. Defense Visual Information (DVI) Directorate. Retrieved September 14, 2012. ↑ Naval Studies Board (2004). "The Role of Experimentation in Building Future Naval Forces". The National Academies Press. National Academy of Sciences. Retrieved September 14, 2012. ↑ Becca Costello (November 10, 2005). "Skateboarding is not a sport:Skateboarding the Sacramento streets takes skill, balance and nerve. Just don't call it a sport.". Sacramento News & Review. Retrieved December 10, 2012. Borden, Iain (2001). Skateboarding, Space and the City: Architecture and the Body. Oxford: Berg.